The phrase, “behind closed doors,” has become synonymous in English with things being done in secret – generally of an unsavory or nefarious sort. Institutions speak of an “open door policy,” and promise “transparency” to those from the outside. Closed doors have always had a sense of secrecy about them. Sometimes the secrecy hides the darkness of evil, other times it protects us from the wonder of the holy. The stories of Christ’s resurrection are filled with closed doors. 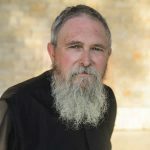 It is a common phrase in the resurrection narratives: “the doors being shut for fear of the Jews.” The disciples had lost their leader and teacher and they feared that they themselves would become victims. That fear led them to flee. It led St. Peter to deny that he even knew Christ. It led them all to hide behind closed doors. Closed doors occur even earlier. The first doors known in the stories of Scripture are the gates of Paradise. Adam and Eve, having broken God’s only commandment to them, are forced to leave Paradise. The gates of the garden are shut and an angel is set at the gate to guard against their re-entry. More than the story of our first parents – it is the story of man. 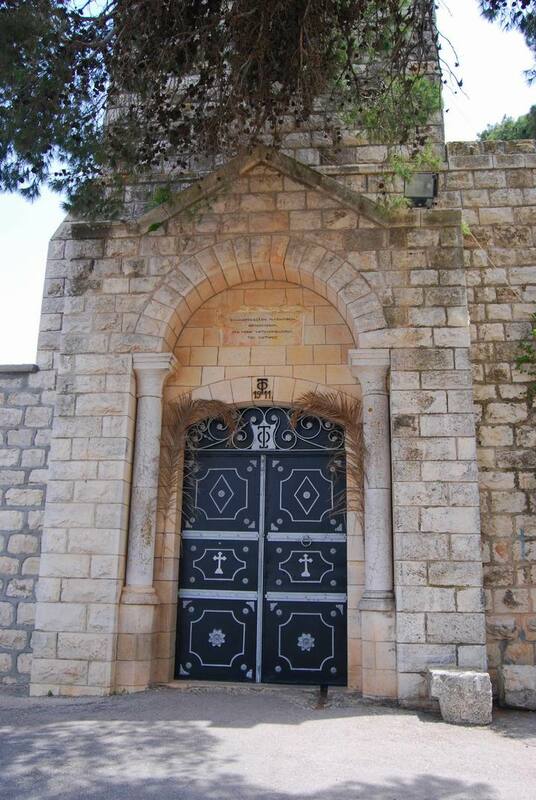 The gates represent the brokenness of our communion with God. We exist – we have life – but our life is somehow cut off, “shut out” of its right and proper communion: we stand outside the Garden. Later mystagogical teaching about the use of doors during an Orthodox service echo this estrangement. The priest praying before the closed doors at Vespers is sometimes said to represent Adam weeping before the closed gates of Paradise. Our own lives are filled with closed doors – places from which we have been evicted – places into which we may not enter – places that represent secrets and broken relationships. Closed doors have gained an infamous character for good reason. I can recall as a child standing outside closed doors while adults carried on arguments (“away from the ears of children”). I have stood outside closed doors as I understood responsible adults to be lying. There have been closed doors of wealth, class, education, ethnicity and dialect. Most people, in most places, have a profound sense that there is somewhere they do not belong. I can think of few things as painful as a door, slammed and locked in the midst of an argument. From the point of view of Christ’s resurrection – the doors are slammed and locked from the other side. The gates of Hades are not closed by God, but by those who would keep God out. The gates Christ smashes are the gates that would refuse entry to the Light of Life. Even the gates of Paradise are closed only for our protection. It is not the joy of Paradise or any pleasure that God would deny us – only our own efforts to approach to Tree of Life in a manner that did not involve our repentance, and therefore our salvation. To have become an immortal sinner would to have been to become like the demons. But at Pascha, Christ confronts the doors of fear. Interestingly, he does not smash these doors. He simply appears within. He does not ask His disciples to first overcome their fears so that He may come to them. He comes to them and their fears are overcome. We cannot do what we must do unless He comes to us. Thus the New Testament image becomes: “Behold, I stand at the door and knock. If anyone hears My voice and opens the door, I will come in to him and dine with him, and he with Me” (Rev. 3:20). It is not God who has closed the doors – it is God who knocks and who appears inside, though they be closed. We live in a world of locked and closed doors. Only a loving and resurrected God could overcome such obstacles. Glory to God who appears behind closed doors and sets the prisoners free. 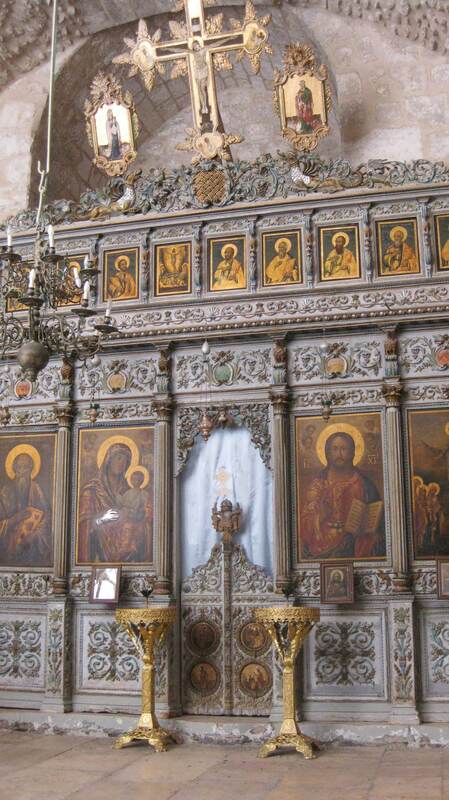 The photo is of the iconostasis in the Church of St. James in Jerusalem. It is very near the Church of the Resurrection. Thank you very much for helping me understand the doors. This clears up much more as well. I recently met with a multi-denominational pastor to learn about the architecture in his Church. I find your explanation much more biblical, and in stark contrast to his. The verse from Revelation is certainly striking! Beautiful post! Thank God for this reflection during this final week of Lent in preparation for Holy Week. Putting this into context with our liturgical life also, all of the doors are opened on the iconostasis during Bright Week! May God be with you during this last week and Great and Holy Week! Pray for us! – from the devaluation that comes with familiarity and our tendency to trespass, trample and take possession and proprietorship of a space. – from the defiled polluted mind of the flesh and its fruit – conflicted, divided, slanted, colored, confused, disorderly thoughts and conjectures. – from our unbelief, deceptions, doubts, scorn, pride, self-centeredness, ambition…and so forth. It must be hardest for a ‘priest’ and a ‘theologian’ to maintain this proper position before God. Scripture shows us that the sons of great priests often began to take liberties and disrespect God’s decrees. 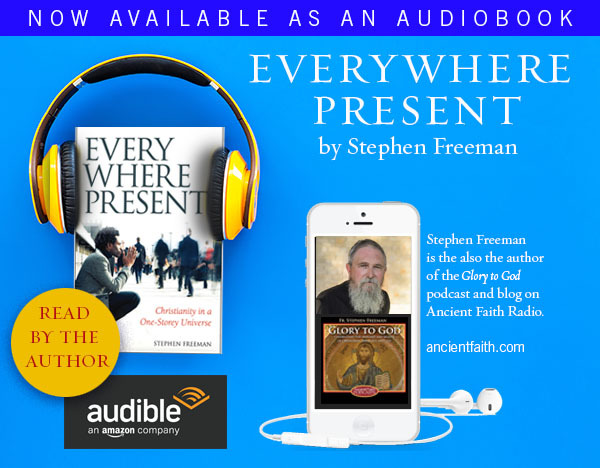 We tend to love our lovely experiences, our testimony, having our needs met by God’s grace generosity, our thoughts, responses, interpretations and meditations begin to have a yeast-like inflating effect, our beliefs expand, or maybe crystalize in a certain set of dogmas, rubrics and corollaries. Gradually, bit by bit; we push against, rebel against the constraints and discomfort of God’s word that pricks our hearts and conflicts with our human nature. Or we react against the excesses, edicts and errors of others. Soon, we have inched our way away from God’s holy Word, Way and Will and have created our own kingdom, sect, religion, or culture. The holy must be guarded, cherished, preserved and protected against the trampling of the sheep, as well as (or especially) from false shepherds. The dangers surrounding even the bests of priests are unimaginable by those who are not priests. Pray for them always. The doors of hell, it turns out, are bolted and locked…from the inside. That may be from The Great Divorce. Thank you for reminding me of things I learned as a child, reminding me that I am still a child of God who is willing and wanting to open doors that I realize I myself have closed. My brother Mark Gibbs has led me to this blog and may I continueto be thankful to him for loving me enough to care enough to show me The Way. Thanksgiving to my brother Mark who loves me enough to continue to show me The Way. The Truth and The Life everlasting, amen.